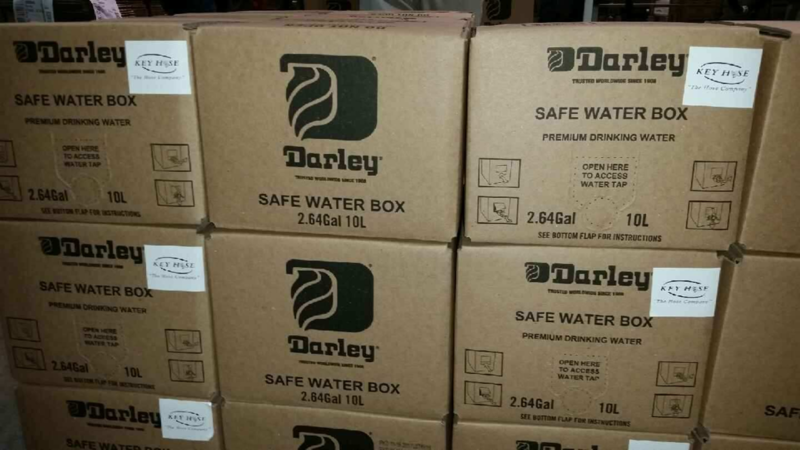 Key Fire Hose and W.S Darley & Company announced today that they have successfully donated 1,840 Darley Safe Water Boxes to Puerto Rico through the organization United for Puerto Rico. Itasca, IL, February 07, 2018 --(PR.com)-- Key Fire Hose and W.S Darley & Company, leaders in the fire industry, announced today that they have successfully donated 1,840 Darley Safe Water Boxes to Puerto Rico through the organization United for Puerto Rico. Each box contains 2.64 gallons of Premium Drinking Water and provides a person 2-3 days of fresh drinking water. Since the hurricane, locals have not had access to clean water, causing a nationwide crisis. Key Fire Hose and Darley are doing whatever they can to help. With their donation, they have provided over 600 people with fresh water. In addition to donating the Safe Water Boxes, Key Fire Hose and Darley are also working with H2OpenDoors to install decentralized water treatment systems in Puerto Rico. The systems will provide a sustainable source of water for locals and are capable of withstanding extreme weather conditions. The water treatment system allows locals to bottle safe water and sell it at a lower price than bottled water. This new enterprise will help stabilize the local economy and further aid the rebuilding process. People in Puerto Rico are still struggling to find fresh water. If you or your company wants to join the movement to help Puerto Rico, please email Kevinsofen@Darley.com or visit www.darley.com/water/humanitarian for more information. Help us help others.